The TI-5033 replaces the TI-5030 II and looks different to the other battery operated desktop printers sold by Texas Instruments. Compare it with the TI-5029 and the later TI-5032 using a LCD instead the green VFD display. 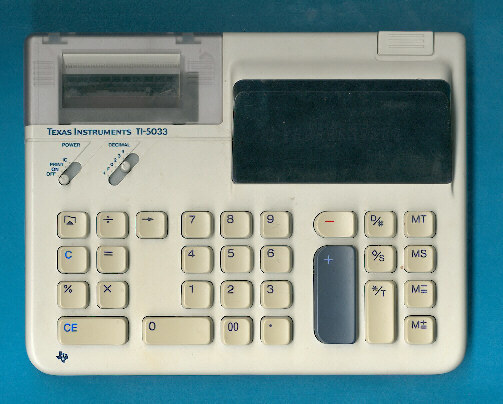 The TI-5033 was replaced already in 1990 with the TI-5033 II sporting a more conventional design. The later TI-5035 II added a two color impact printer. © Joerg Woerner, December 4, 2002. No reprints without written permission.